Does anyone know which derm programs (not including the french ones) for which you basically need to do an elective in to match to? I know U of T is one of them. This isn't a direct answer to your question but you can extrapolate from this that you don't *need* an elective to interview/get ranked, but chances are you will match to a place you did an elective at. Assume that the more desirable the city/program, the more you probably need an elective to get an interview. Long story short: Do an elective at the school you want to match to (this applies to any speciality). What site did you get this data from? I'm curious about this info for other specialties. If you don’t do an elective where you are applying for a competitive residency spot, and other applicants have, you increase your chances of not being seriously considered tremendously. They need to know you at work, not just on paper and in a quick interview. When I applied for my competitive surgical position (3 spots, 40 Interviewees, 80 applicants), the resident I worked with, staying late often, was on the Panel of 6 Interviewers, knew me as a hard working, enthusiastic team player, knew the attending wanted me on the team and he could have been my advocate before the interview. Had they known me on paper only, I believe I would not have had a chance. 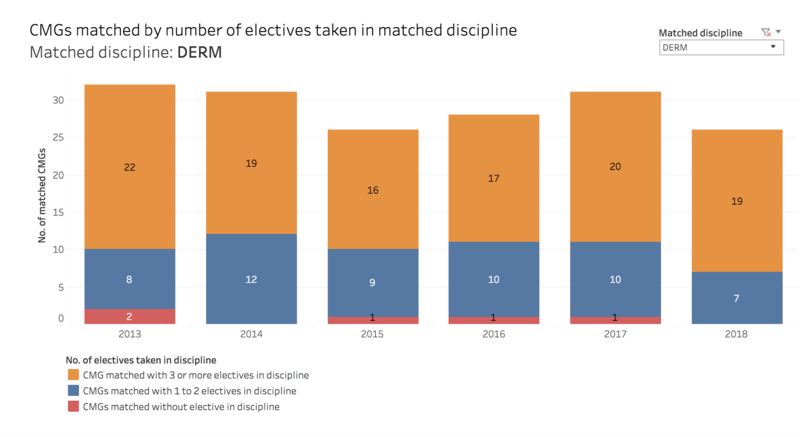 in the 2nd graph when it says "elective in discipline at program school", does that mean they did an elective specifically in derm or they did just any elective at the school. i think you can do an elective in dermatopathology or rheum or allergy, something like that. re: graphs, it refers to electives taken in Derm - which means there were only 5 who matched to a program without a prior elective there. Included in the data are the 8 French-speaking spots which traditionally have had incoming residents with fewer electives in the discipline, generally speaking (both by rules and availability). there are definitely electives related to derm - it used to be part of IM years ago. This could be more of a factor in future matches when # electives will be limited for all applicants.